District Cooling Systems – Many countries experience hot summers which impose a need for air conditioning in order to achieve and maintain a comfortable indoor environment. Air conditioning has traditionally been provided to buildings by electrically powered air conditioning units however, this equipment can have a high power demand. Many cities across the world are exploring alternative and more energy efficient cooling solutions. One such solution is a District Cooling System (DCS) which involves the production and distribution of chilled water to multiple buildings through a network of insulated underground pipelines. Each building connected to this central system is connected by an Energy Transfer Station (ETS). The ETS typically uses a heat exchanger to chill down the water of the building using the district mains. This chilled water within the secondary building system is then used for space comfort cooling and process cooling. This essentially means that there is no requirement for chilled water plant to be installed locally in each building. Each building operator therefore purchases chilled water from the central provider. District Cooling Systems include central chiller plant, pumps, valves & distribution pipework. Chilled water is often generated at the central plant station by dedicated chiller units. Free cooling can also be achieved by using water from nearby rivers, deep lakes etc. There are many examples of such systems such as in Paris where water from the river Seine is refrigerated to around 5oC and transported 71km to serve circa. 5 million square meters of offices, hotels, theatres, government buildings and of course, the Louvre. Another notable example case is one of the world’s largest district-cooling system schemes at The Pearl-Qatar. Figure 1 provides an example of a District Cooling System as designed and modeled using FluidFlow software. 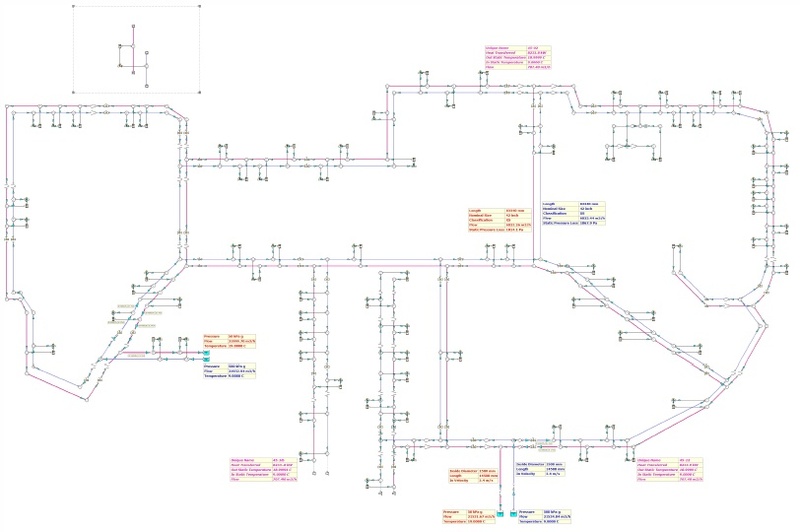 This system uses two “central” cooling plant locations to provide chilled water which is then distributed through a network of 17.8 km pipework to serve 48 Energy Transfer Station’s. Figure 1: 505MW District Cooling System. District Cooling Systems have been quoted as offering a more energy-efficient approach to achieving cooling as they can reportedly consume 20-35% less electricity in comparison to Individual water-cooled air conditioning systems and traditional air-cooled air conditioning systems respectively. Other benefits of such systems include; lower CO2 emissions, reduced pollution, air-conditioning provided from a sustainable source, reduced maintenance costs for users, lower operating costs for users, increased reliability and increasing the potential for economics of scale.